This card is made using the Glance stamp from Stampendous! I love how this stamp has an almost ‘Audrey Hepburn’ look about her. I had another play on Skype with Shirley…learning how to use the products that I’ve got in another way. How to be a little bit more random in my designs…and just having great company while I craft. I’m still learning to embrace white space…but that will come. I have teamed her up with the Big Dots, Maple Branch and Crusade Dreamweaver stencils…these are background stencils and ideal for the layering effect that I was after. Andy Skinner also designs for Stampendous and I have used some of his Industrial stamps to add interest to the layers of distress paint underneath. A little bit of stamping, tone-on-tone, was done quite simply using some birthday words. This card was pure fun to make!!! Lots of paint, stencils and stamps. And a whole lot of randomness. You have shown her off to perfection Dot, I just want to run out and buy the stamp. All the Background layering frames her face beautifully. Wooohoooo! !Go Dot! 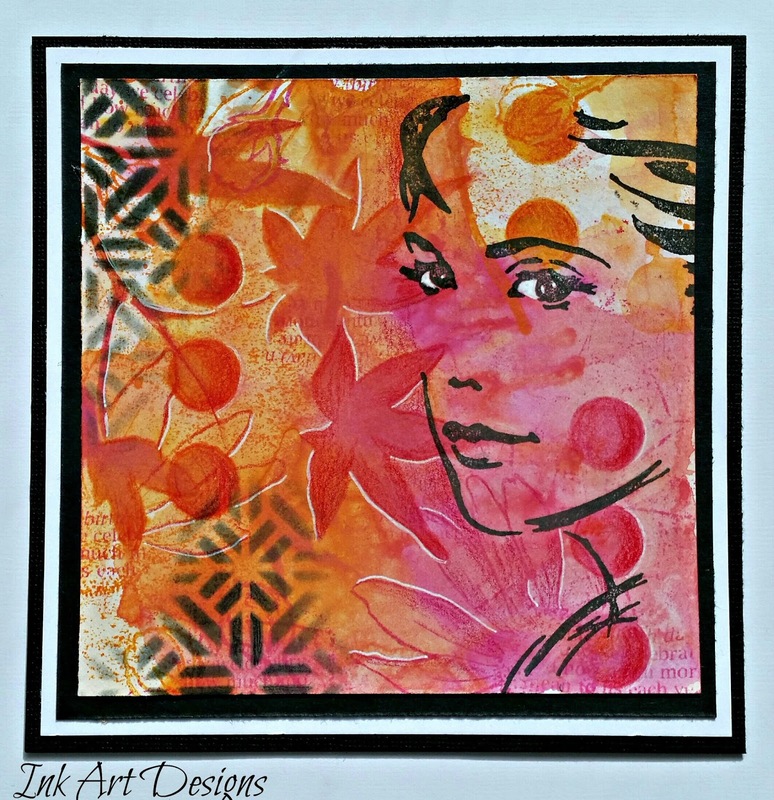 fabulous, love the colours (I have the stamp so brilliant to see how you use it) – keep up the wonderful artwork. I'm going on holiday in a weeks time so am frantically trying to schedule the blog for while I am away!!! You have created a stunning background for this amazing stamp. Thanks for playing along with us at Cardz 4 Galz. Hope to see you again. Caz DT.